As people more and more demand for polymer functional materials research and development, lab extrusion molding equipment reliability is also more and more get the attention of the enterprises, research institutes and universities, is no longer the previous point of view: "I have, and it can work is ok", but a small extrusion equipment in laboratory is required to have the technical characteristics as production line, and some of the user is completely according to the production line to simulate the custom of experimental equipment. The commonly used polymer processing and molding equipment includes: small extruder, small cast film machine, small calender machine, small blown film machine, small laminating film machine and so on. As the most important part, the performance of small extruder directly influences the experimental results. 1.The dimensional tolerance of extruded products will be reduced to the minimum, so that more products can be made from materials of unit weight.It is more necessary and valuable to use the melt pump when the dimensional tolerance of the extruded product is strict or the raw material cost of the product is expensive. 2.The mixing quality and output of the small twin screw extruder combined with the melt pump are greatly improved compared with the single twin screw granulating unit.The energy consumption per kg of material can generally be reduced by about 25 per cent. 3. Melt pump, pipe, plate, film and other extrusion dies are installed on the former single screw or twin screw granulating extruder, which can save the direct extrusion products in the granulation process. This system is very suitable for extrusion products where materials need to be modified by blending. In addition to the advantages mentioned in No. 2 above, the melt pump system can save energy by simplifying the production process of extruded products and shortening the production cycle. 4. It can supply material to a melt pump at the same time with several medium and small extruder, and supply large products (large diameter pipe, wide width plate, film, etc.) to the head after pressurizing and measuring by melt pump.The production line with this configuration is compact and small.The section size of extruded products is more accurate and easy to control. 5.The single screw exhaust extruder is equipped with a melt pump, which can make the system operate freely and have excellent performance. Under high head pressure and high output, the output can be adjusted at will and no overflow occurs. For example, PC/PMMA composite board, PMMA light guide board, etc., the positive role of melt pump is beyond doubt. The melt metering pump plays an important role in the stability of extrusion. In the laboratory stage, after the small extruder is equipped with the melt metering pump, it can be as close as possible to the actual production environment, and the sample sample can be prepared well, which has a very positive role in guiding the production process. 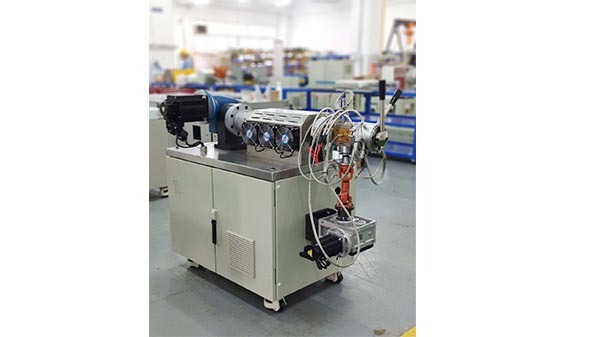 The experimental line of the small extruder and the small cast film machine composed of small extrusion cast film test line, it can make the film thickness more uniformly if the melt pump is added. Excellent longitudinal thickness can be obtained with the precise linear speed of the roller and melt pump extrusion. The performance of transverse thickness is mainly determined by die adjustment.